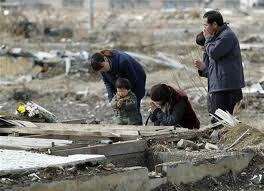 When the earthquakes hit Japan last March, I was still teaching. Many of us had been given smartboards in our classrooms just a few months before, smartboards being these high-tech devices that are part whiteboard, part projector and part computer. As a result, I was able to show my classes almost real-time images of the devastation occurring on the other side of the Pacific. I knew that for most of them, it would be difficult to appreciate the magnitude of the tragedy; hell, I couldn’t appreciate the magnitude of the tragedy, and still can’t, and hopefully (and I say this with all due respect) never will. Somehow it felt right to experience the geographically distant catastrophe with the community of my students. We didn’t talk much about it; we didn’t know much beyond what we were seeing. We just looked at the horrible, impossible images together, and drew a little closer together as people in the classroom. Thinking back on it a year later, I feel lucky that I was able to be around my students, and how awful it would have been to have no one to turn to in those moments. 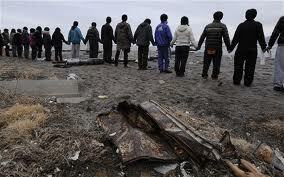 The following represents my best effort to produce a memorial poem on the occasion of the first anniversary of the Great East Japan Earthquake and tsunami.